The secret is to STOP focusing on FOOD decisions. And START focusing on IDENTITY and RELATIONSHIP decisions. Would you like to know what’s been missing in your painful, frustrating, un-winnable effort to get thin? STOP focusing on FOOD decisions. START focusing on IDENTITY and RELATIONSHIP decisions. That’s why the THIN & BLESSED program is simple, fun and crazy-effective, especially if you’ve unsuccessfully tried many upsetting diets over many years. 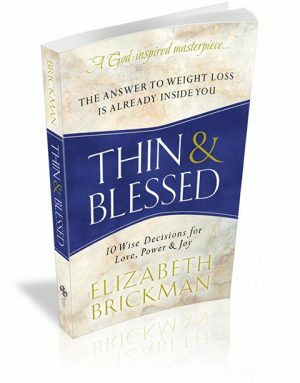 With THIN & BLESSED, you simply make 10 life-enhancing decisions about who you will be and how you will relate: to God, to food, and to yourself. Relationship and Identity. Period. That’s it. Suddenly, weight loss is easy – especially if it never was before! Why should you force yourself to adhere to anybody else’s insistent rules about your food choices? Imagine how freeing it is to eat like YOU and still get thin! You choose whatever foods, food groups, or food plan feels right and good and appealing to YOU – and nobody else. STOP focusing on FOOD. START focusing on IDENTITY and RELATIONSHIP. And you can reach your dream weight, just like I did! I yearn to share exactly how I did it. My proven step-by-step decision guide has successfully empowered many enlightened people to finally get thin – including ME, at age 60! Hundreds and hundreds of pounds have been reported lost by grateful men and women all over the country. Those pounds will never be found again. IDENTITY and RELATIONSHIP – incredibly enough, that’s all that’s been missing, all this wasted time. Imagine that! Posted in Thin & Blessed | © Copyright 2019 The Trusted Author.